Did you know that video game technology has become so advance that we are able to use it to make the most mundane activities exciting? From punching trees in “Minecraft” to driving trucks across Europe in “Euro Truck Simulator,” it seems like there is nothing a capable developer can’t turn into compelling subject matter. While managing a series of trains, railways, and cargo has been on that list for a while thanks to a surprisingly strong amount of train simulator games, developer Nimblebit presents maybe the most compelling example of the idea with “Pocket Trains,” the next in their line of incredibly addictive series of games that focus on micromanaging a specific set up (for example their airline manager “Pocket Planes”). 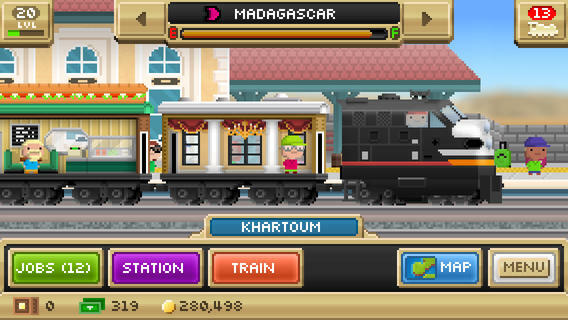 “Pocket Trains” doesn’t deviate from the formula set in the studio’s previous games much, but it does manage to almost perfect it. You start off with a couple of trains and a few railways available to you in Europe, which you use to deliver a variety of, often wacky, cargo from city to city. Completing a run awards you points and cash which are used on everything from purchasing new parts to build more trains, upgrading current trains to be more efficient, and buying new railways to connect your available cities and expand your cargo empire all over the world. There’s a variety of additional gameplay elements such as challenges which provide additional rewards upon completion, along with an RPG like level system that also rewards you as you advance, and while thy are very welcome, the real draw is the addictiveness of the core gameplay. It’s actually quite difficult to build a functional railway system, mostly due to the fact you that each individual train can only occupy certain lines (unless you buy a line out each time which gets costly) meaning that you have to strategize the use of railways and hub cities to maximize your best trains potential. Despite those complexities, the very basics of the game are so simple that learning the deeper ins and outs never feels like a chore, and rather extends the gameplay naturally. Put it all together and you’ve got a game that manages to achieve that rare balance between being brain teasing and easy to pick up and play, that could only come from years of honing this style of game to perfection. You may initially pick this up as a curiosity or because you subscribe to the “what the hell it’s free” school of app downloads, but just know that doing so is the equivalent to signing hours of your free time away building a railroad empire that dominates the globe. Most mobile games have to choose between being something perfect for short sessions and killing time, or going for something deeper that asks for hours and hours of your time to truly appreciate. That “Pocket Trains” manages to seamlessly combine both of those game types into an experience that is near impossible to put down is a feat that can’t be overlooked. You may not think “Pocket Trains” sounds like it has much potential, but it will crush your reservations and pull out of the station with your free time, along with the title of app of the week.